I picked up my new Elkaholic long bow from my buddy Don Reeves last week while hunting in NY. I tried my hardest to get some blood on it up there but only got one shot and blew it, shooting low on a nice little 6 pt. Came home to NC over the weekend. Got caught up on some work and hit the woods this afternoon. I was mainly going out to check on some scrapes and put a camera out. On the way home I plopped down behind a tree with only about 15 minutes day light left. Thinking I was nuts for sitting down at all. The deer would have to walk to me on the very same trail I just walked twice. The wind was in my favor though. I sat probably a whole 3 minutes when I see a deer walking towards me. He has no idea I am there. As soon as he goes behind a tree I draw. He steps out and I release, the arrow travels a whopping 5 yards to the target. He goes down in sight. I can't believe this just happened. Thanks Don for building me a great bow. This may be a spike but our OBX deer are a little shallow in the gene pool. By looking at the teeth I am guessing 3-4 years old. I will find out for sure from the biologist. The bow is an Elkaholic Archery longbow. 53@28 and one of the best bows I have ever owned, fast and dead quiet. GT with Muzzy's on the front. 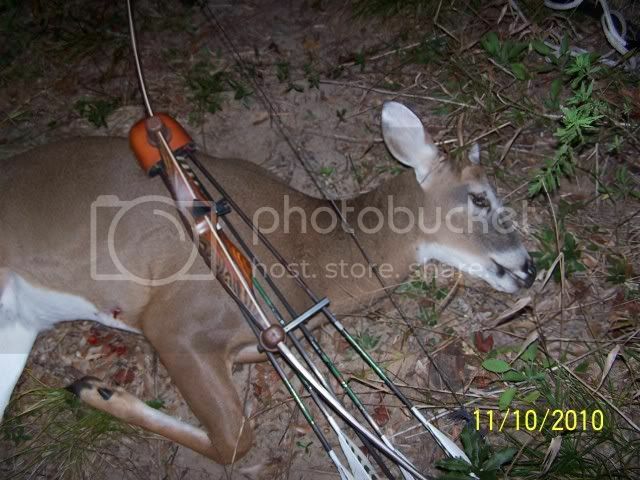 Pretty bow and nice deer! Nice. Spikes taste just fine! oh that is a great story,..
Nice bow and a good eater! 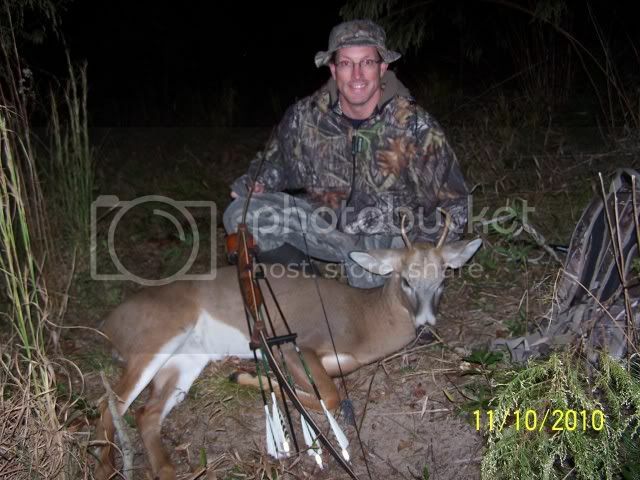 Congrats, nice bow and a great way to break in that bow.